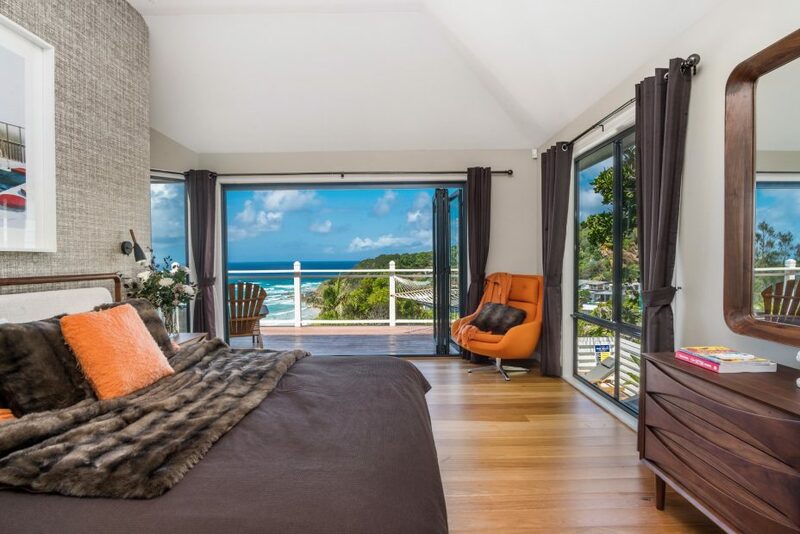 Byron Bay Luxury Beach House, overlooking Wategos Beach. 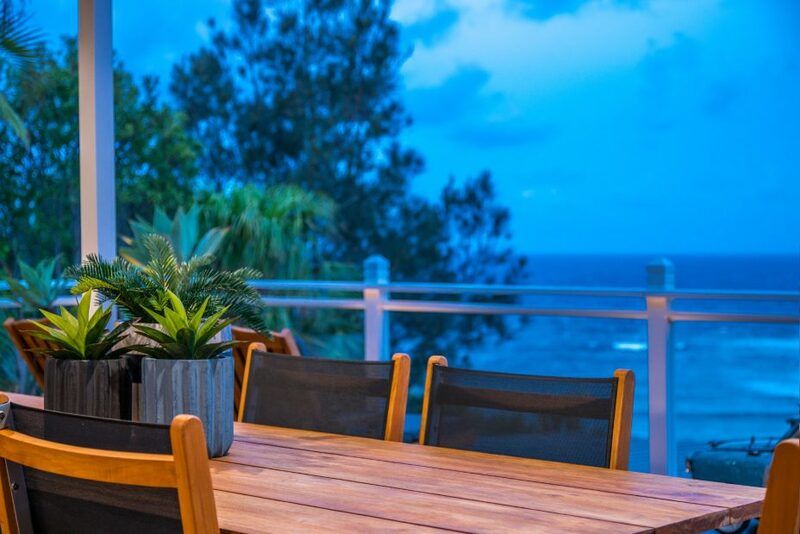 Welcome to The Palms at Byron – a luxury 3 bedroom, 3 bathroom Byron Bay beach house, set amongst tropical bushland and elevated high above Wategos beach, with stunning panoramic ocean views. 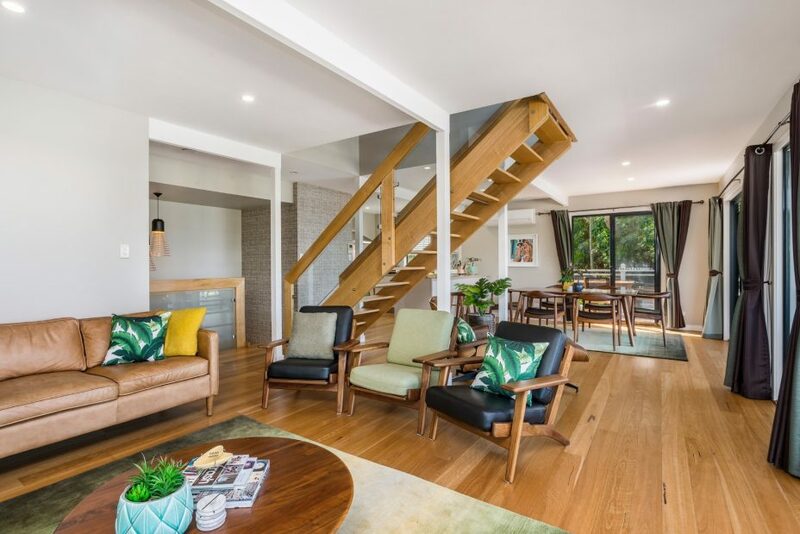 This unique A-frame style holiday home has a contemporary mix of modern-retro luxury styling, in honour of Byron Bay’s formative years, the 60s and 70s. 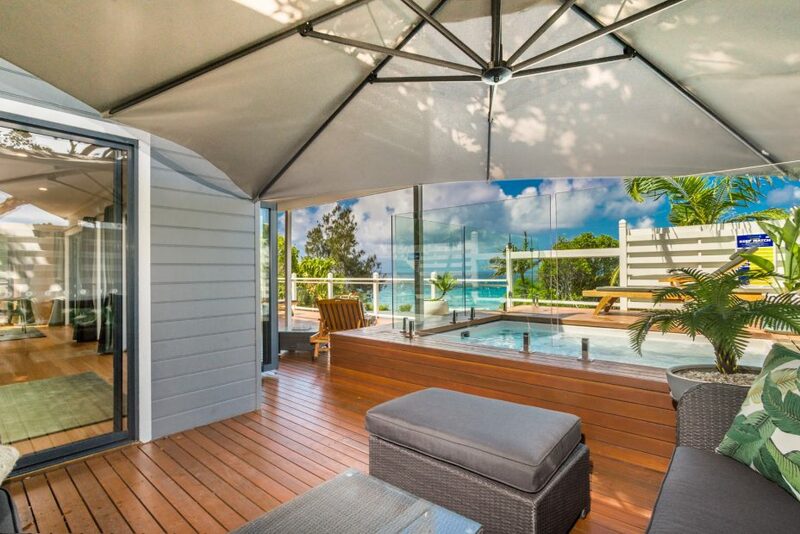 Polished floating timber floors, high-end furnishings and quality finishes promise luxury living, right on the beach. Light-filled and open, the ground floor of the Palms features spacious living and dining and a modern, fully functional kitchen with upmarket copper appliances. 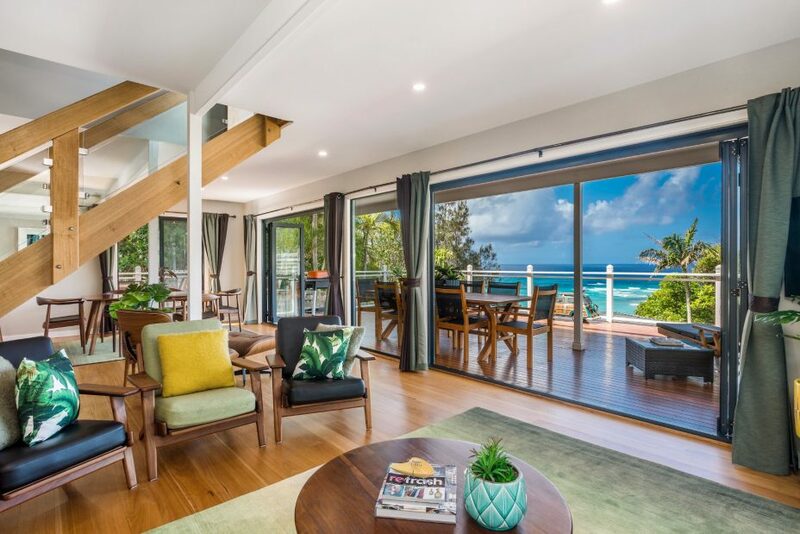 With a seamless indoor/outdoor flow, step out from the living space to a generous covered outdoor entertaining space, complete with BBQ, large spa/plunge pool, outdoor dining and sun lounges, as well as spectacular views to Wategos beach and the Byron Bay coast and Hinterland. 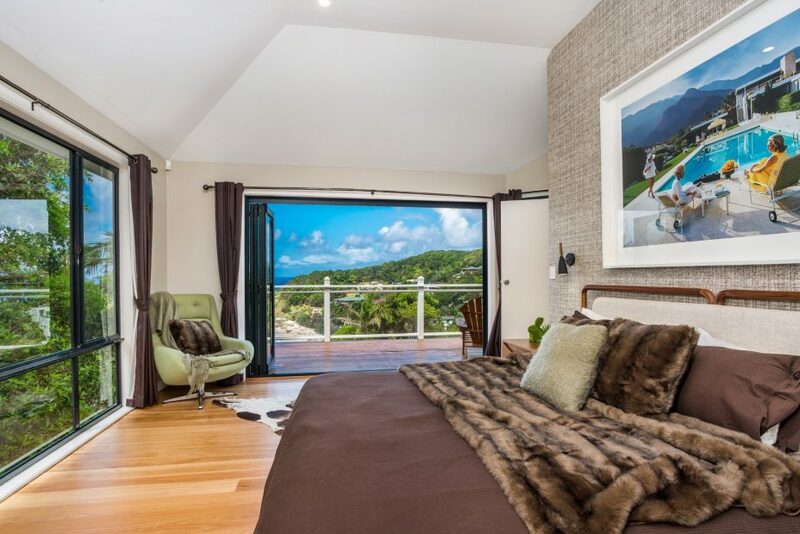 The second floor is home to a luxurious sleeping space, with 2 spacious bedrooms laid out in a unique mirror-image style and each featuring ensuite bathrooms, TV and amazing wall to wall glass to enjoy endless ocean views all the way to the iconic Byron Bay lighthouse. 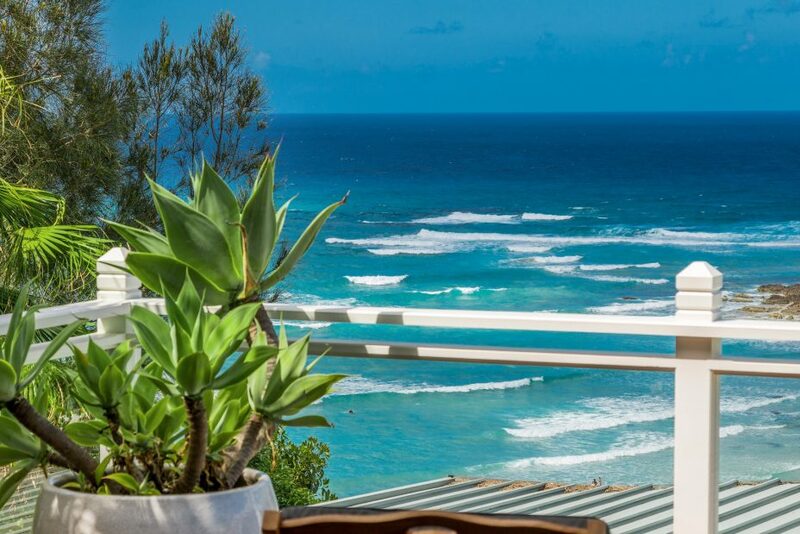 Drink in those 180 degree views from the private upstairs balcony space and sway through summer days on the hammock. 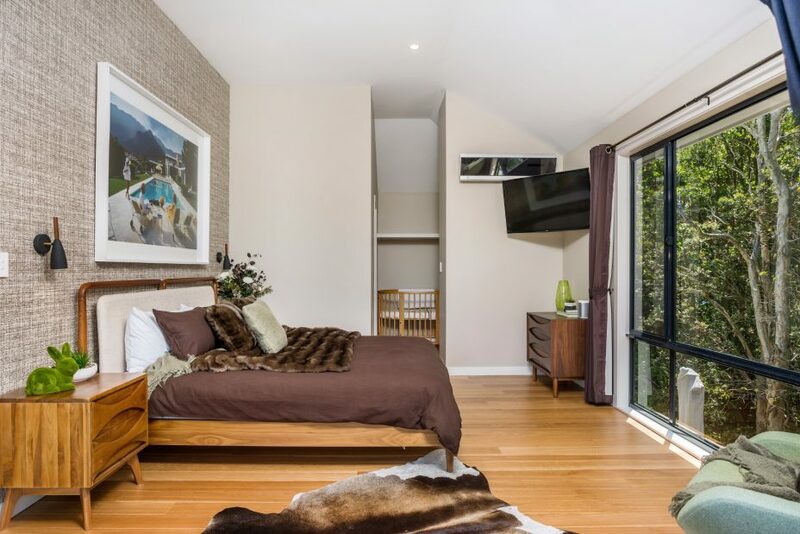 Just 2 metres from the main house is a studio space, home to a 3rd bedroom with modern retro styling and its own private bathroom. 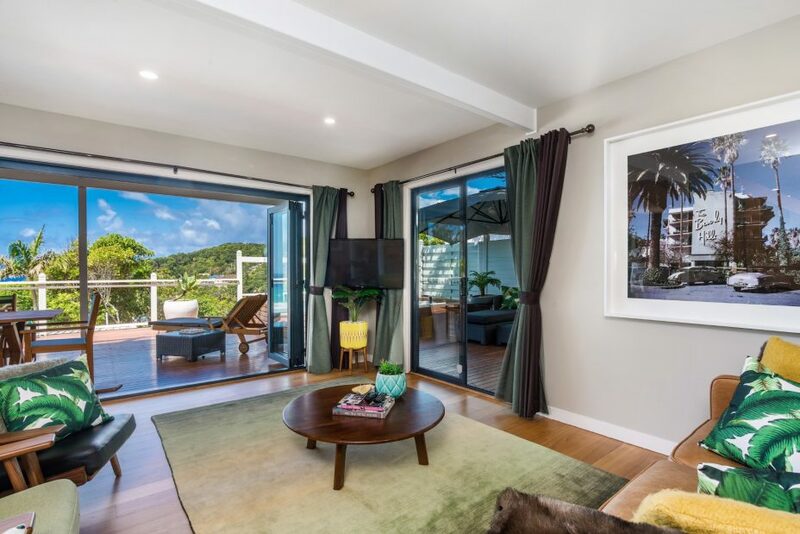 The Palms is located within the exclusive enclave of Wategos Beach and promises the utmost privacy, nestled within tropical bushland and neighbouring crown land. 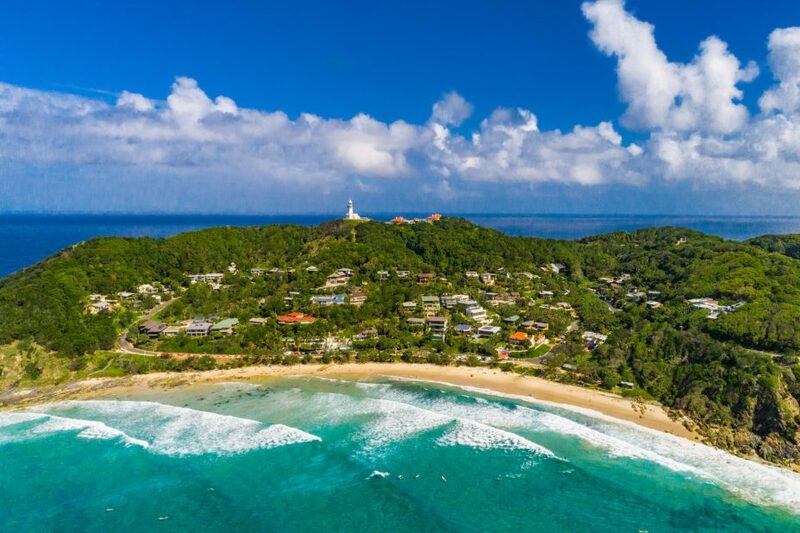 A short 50m stroll will see guests at Cape Byron walking and running tracks, whilst a mere 500m metres will have you swimming at beautiful Wategos Beach – the small and protected pocket, nestled within Cape Byron, just beneath Cape Byron Lighthouse. 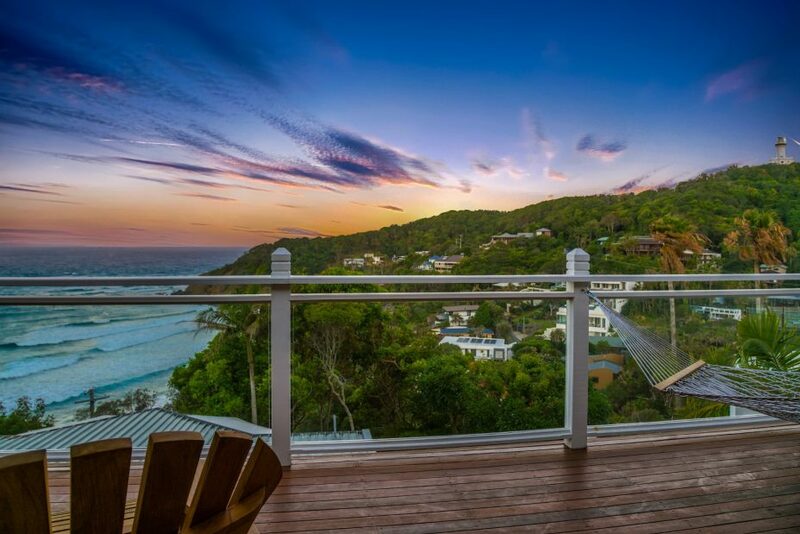 From the great location, walk to Byron Bay town along the stunning coastal boardwalk. Spacious and open, the living and dining areas at The Palms showcase contemporary retro styling, all framed by the amazing ocean views. Relax on luxurious leather lounges in the living space, with glass doors opening out on both sides to the generous outdoor living area. A high-end 6 seat timber dining table promises luxury dining, with dual access to the balcony outside. 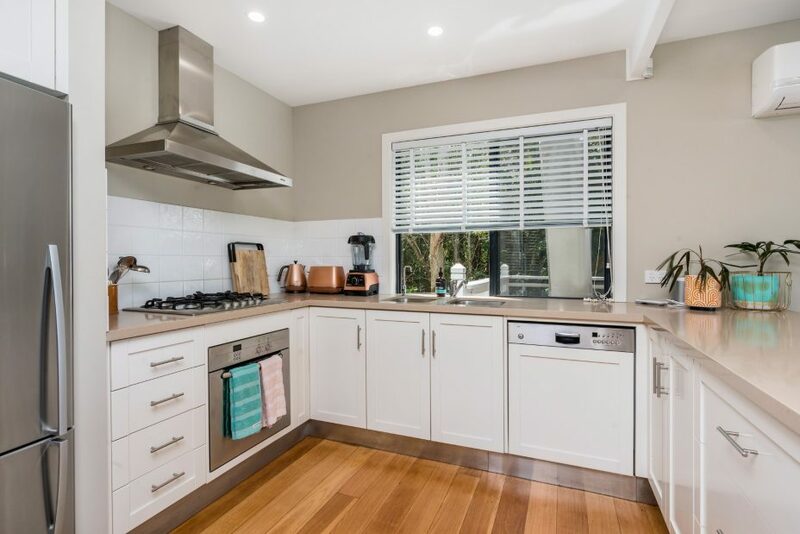 Easy and elegant, the kitchen at the Palms is bright and breezy, with modern white finishes, stone benchtop, gas cooktop and quality copper appliances including rangehood, oven, fridge, Vitamix and Delonghi Nespresso coffee machine complete with coffee pods. Dine in casual style with breakfast bar seating for two. 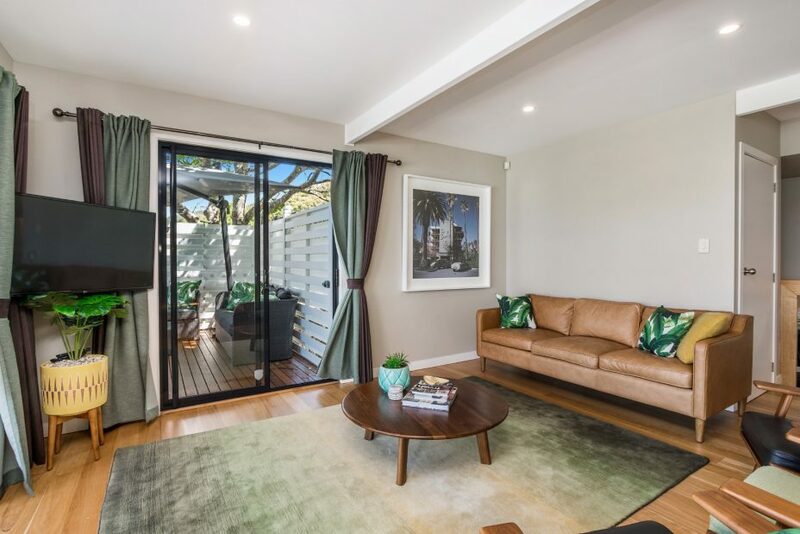 Indulge in The Palms at Byron delectable sleeping space – two large bedrooms dominate the second level and a third bedroom is located in the studio space, all with bathrooms. Plush linens, quality furnishings and luxury retro styling promise sublime slumber. 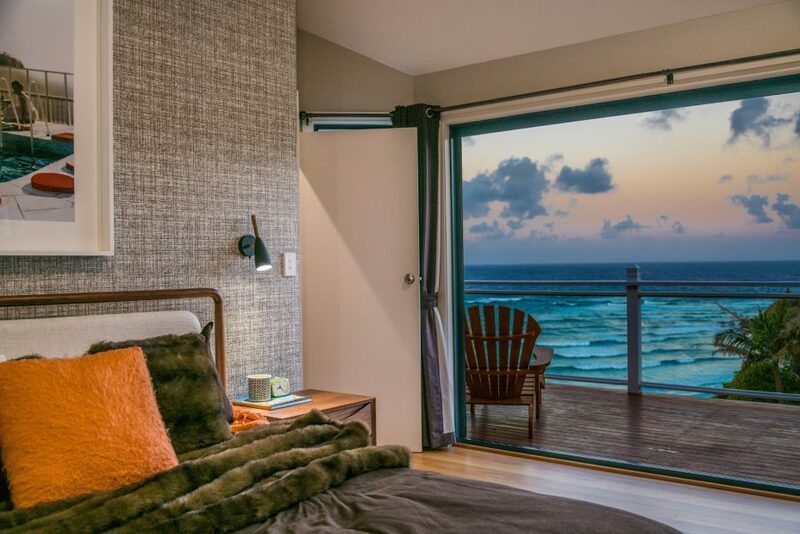 Drink in the panoramic ocean and Hinterland views through wall to wall glass from the comfort of your king size bed. 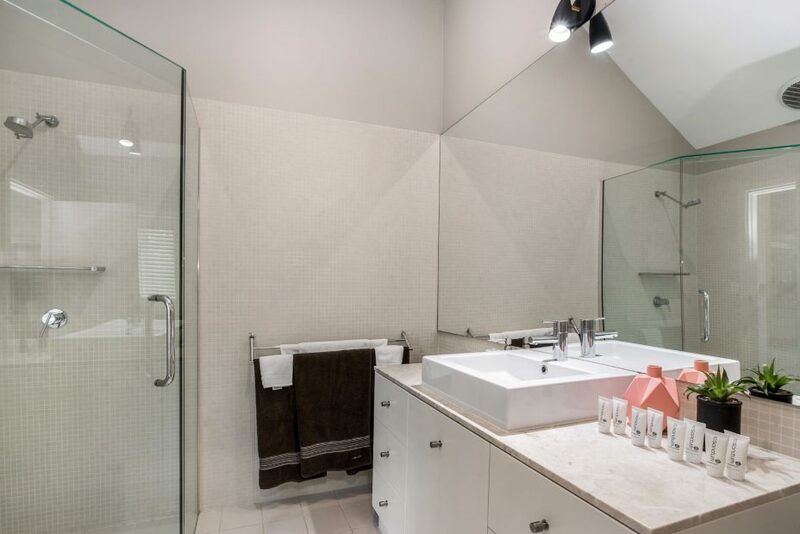 Choose from three bathrooms at The Palms at Byron, with each bedroom in the main house including a modern and stylish ensuite bathroom, complete with shower and toilet. The studio has its own separate bathroom to the right of the entrance. 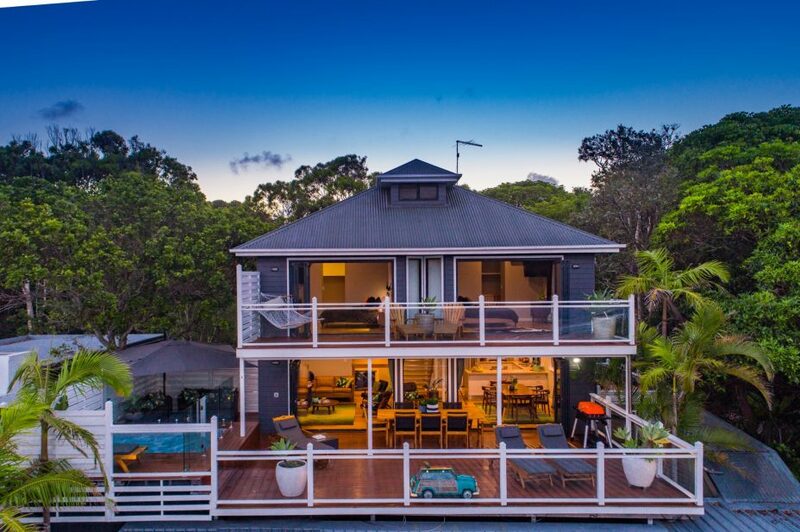 This double-storey beach house maximises its stunning surroundings with two large balconies lined with timber decking and framed by opaque balustrades. 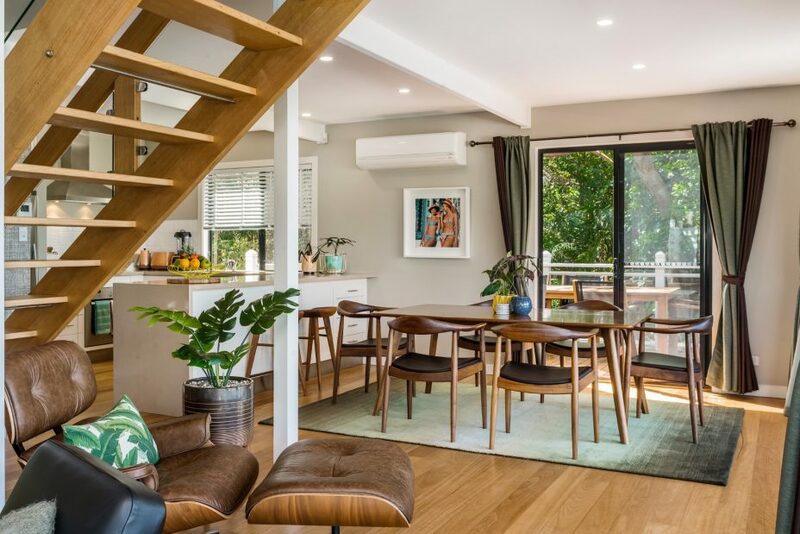 The downstairs balcony is large and open, featuring part shade and part sun areas and luxury sun loungers, BBQ and 8-seat timber outdoor dining. 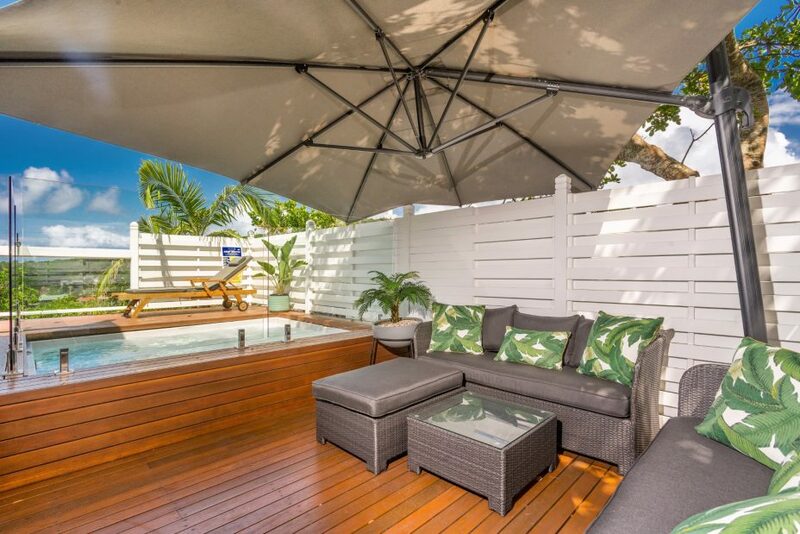 Additional outdoor dining sits behind the Jacuzzi, accessed from the dining and living areas. Upstairs, a large covered balcony features timber lounge seats and a hammock. 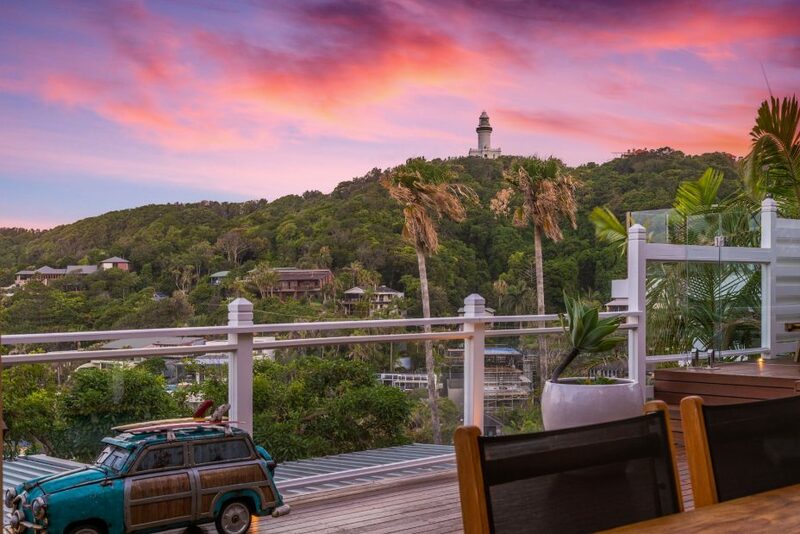 From the outdoor space at the Palms, enjoy incredible and unrivalled 180-degree ocean and Hinterland views of Wategos Beach, the Byron Coast and all the way to the iconic Byron Bay Lighthouse. Built into the ground-level entertaining deck is a large, elevated, luxury 10-person spa pool / Jacuzzi. 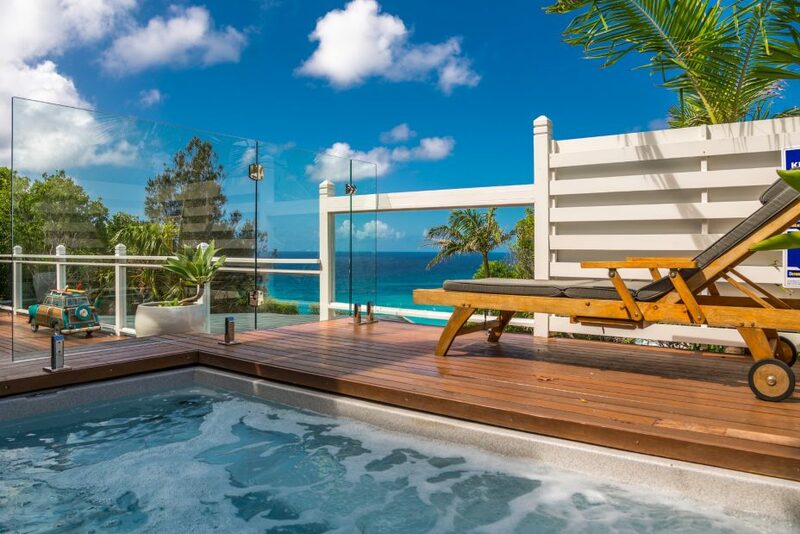 Soak in the spa whilst taking in the spectacular panoramic ocean views. Explore Wategos and beyond using the two vintage bicycles included at the property, there is also a longboard surfboard which guests are welcome to use to make the most of the glistening local waters. 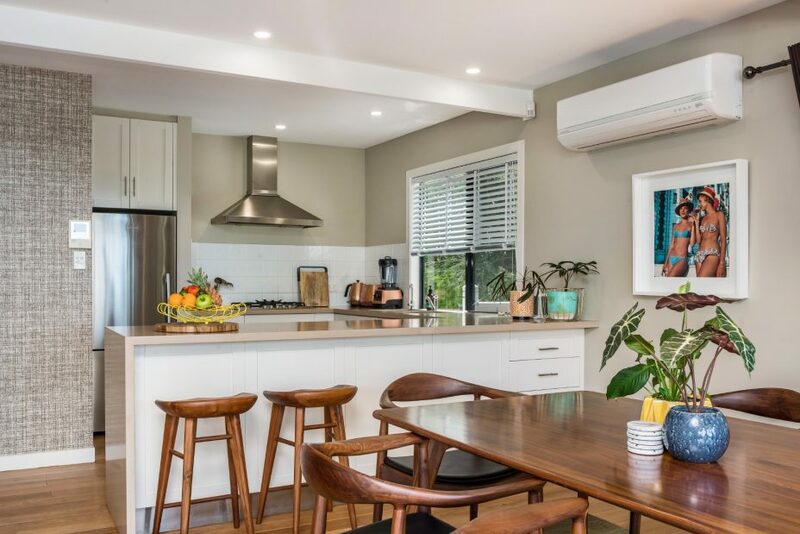 The Palms included reverse cycle air conditioning in all bedrooms and the dining space. Complimentary guest Wi-Fi is also available. Security gates for additional privacy are installed at both the front and side entrances of the property. The Palms offers two covered car spaces beneath the carport and an extra car space in the private driveway, all secured within a security gate system. 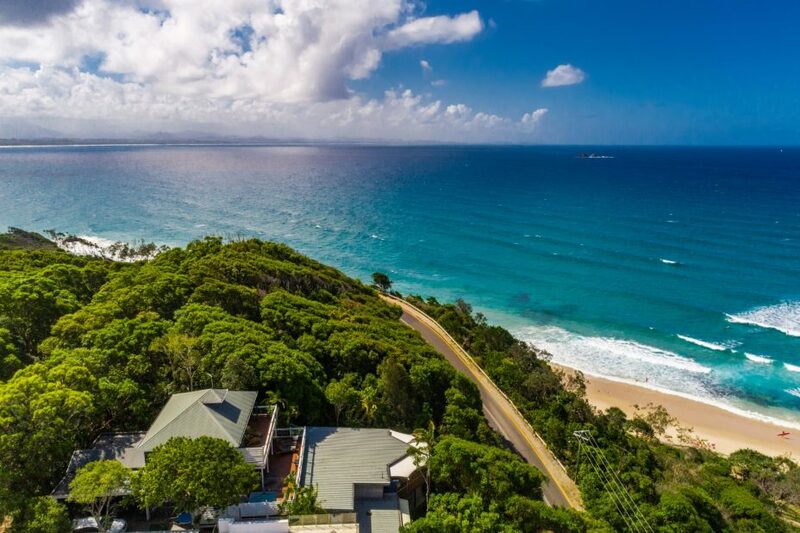 Superbly located at Wategos Beach, the Palms is only a short drive to Byron Bay town or beautiful 20-25 minute walk, along the stunning coastal boardwalk. 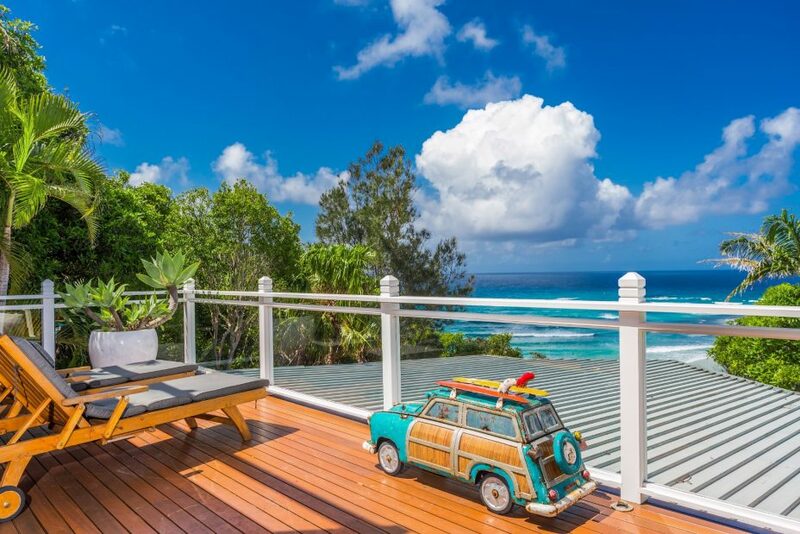 Stroll from this amazing holiday home only 500m to swim, surf and play at Wategos Beach, the small and secluded piece of coast, just below Cape Byron and the Lighthouse. 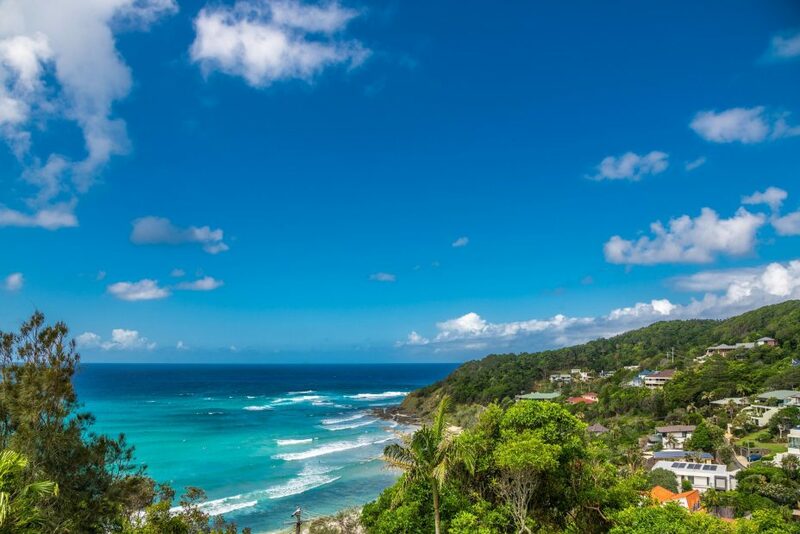 Along the rear of Wategos Beach is the 4km Cape Byron walking track – a must see for visitors to the Byron Bay coast. Group restrictions – maximum of 6 adults at the property. Christmas and New Year Bookings: if dates include both Christmas Day and New Year’s Eve a 12-night min stay applies.